What’s better than a happy ending at Pet Resource Center? Two happy endings. Last week we had an emergency visitor when 7Roc, a much-loved dog, was hit by a car. 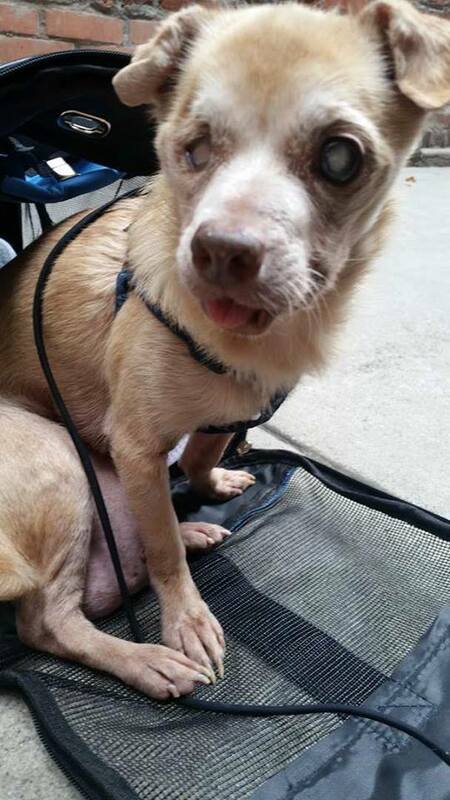 His person rushed him to PRC at the Inner City Law Office where one of DDR’s counselors was able to rush him to our partnering vet for an exam. Luckily 7Roc, a sweet grey and white pit bull only has a broken paw and will spend a few days at the vet resting up. His grateful owner tearfully thanked us for providing help that he didn’t have the funds or resources to give on his own. Your donations make it possible to offer this support for the Skid Row Community. 7Roc wasn’t the only pittie that we were able to help last Wednesday! 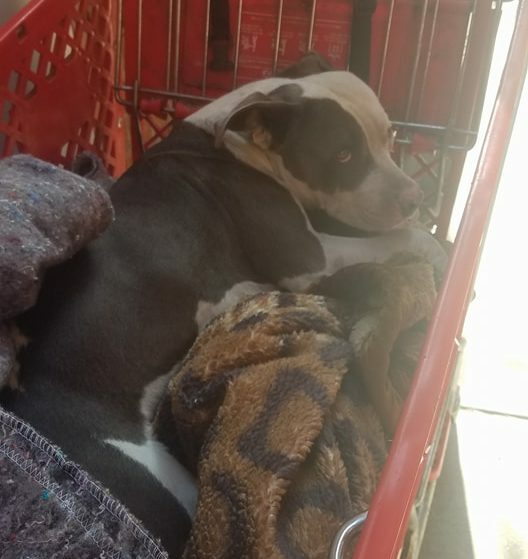 A middle-aged man brought in Mr. Bones, a beat-up looking pit bull who he adopted while living on the streets. The gentleman had been living on the streets for some time when Mr. Bones wandered into his little encampment. No one knew where he came from, but he had found his new home. His person heard about PRC and brought Mr. Bones to Woof Wednesday to receive help for an injured leg. Our transporter, Sandy, took Mr. Bones to our vet and it was determined that his limp was from an old untreated injury and nothing could be done for it now. Mr. Bones’ person is willing to take care of him; share his tent and all that he has. It was obvious that Mr. Bones is very attached to him already, and rightly so. We then found out that this kind gentleman is also feeding stray cats! Thanks to donations, we were able to give him food and supplies. How humbling that this man, who has very little for himself, is still helping stray animals. There is still kindness in the world. To help the people and animals that visit us at PRC’s Woof Wednesday, we need your support. Donate to our Race for the Rescues campaign and we can continue to provide spay/neuter, medical care and supplies to help people who care for the animals in Skid Row. GIVE on NBC featuring Downtown Dog Rescue and Amanda Foundation airs this afternoon. Tune in to watch our work and the surprise gift from ASPCA. How one man, one dog, and one night can make a difference. 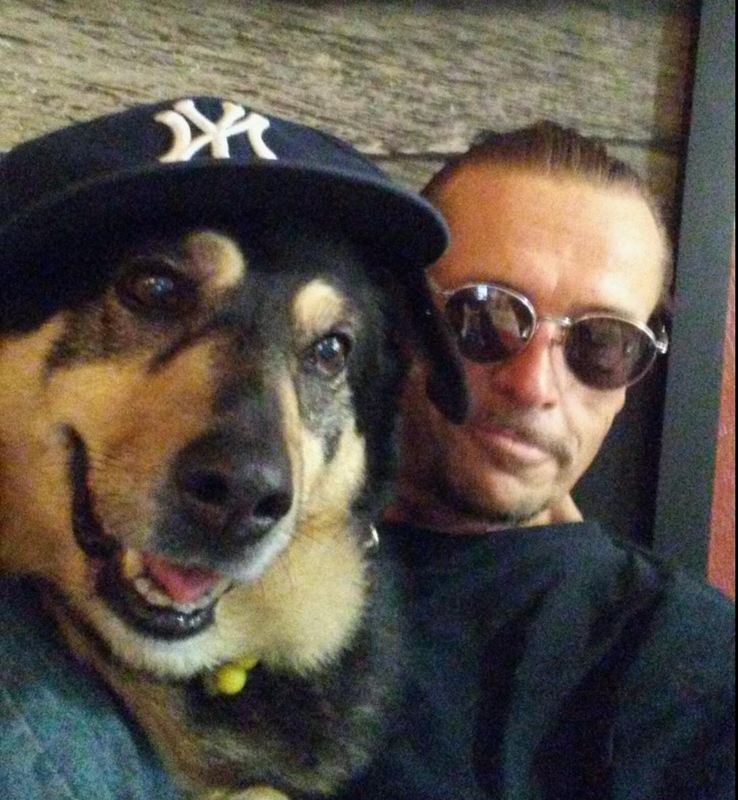 People ask us all the time: Do you still help homeless people with pets? Our answer is, Yes. Of course we do. But there’s more to that answer than we usually share, and those unsaid words are actually the most important. The real answer is, No. We help people with pets. More and more, we are hoping to move away from the label of homeless, because for many who live outside, they do have a home. Their home is the street. 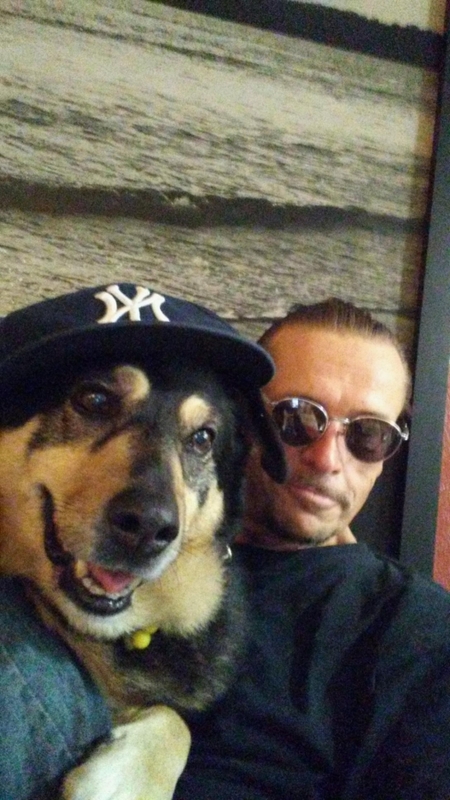 Here is a story of one such man, his one dog, and their home on the street. This is a story about how a few of us worked together to help them. This duo has been together for thirteen years, and many of those years have been spent camping at a park or under a bridge. They go everywhere together, do everything together, and this gentle man brushes his dog every single day. He calls her, “his heart.” Having seen them for months in the area, sometimes panhandling for money, sometimes simply walking by, we got to know them. We asked for their names, their stories. We shook his hand and stroked her Shepherd ears. And what happened over the course of our encounters with them is that we began to care for him and his dog, as we have cared for many families before who have also lived on the street. We decided it would be great to give them a night in a comfy motel room. We were over the moon at the idea of helping this pair have a chance to recharge. Even if it was only for one night, and even if it didn’t “solve the problem,” we felt this small gesture would mean a great deal. And we were right. A night of peaceful, dry sleep. Of hot water. Of feeling safe. Can we put a price on that? Don’t we all deserve that? Isn’t it possible to feel renewed by everyday niceties? Solving problems cannot be accomplished without first taking action. For this one man and his dog, a connection, which did not exist before now, came into his life. Similarly to when we rescue or adopt one pet from an animal shelter, it does not solve the entire shelter system or all the pet overpopulation problems. And yet it is worthwhile. It means something to touch that life. So we take small actions, and over time we look back at a pile, a heap of steps traveled, and we see they have grown large. They then become a foundation. We spent our Valentine’s Day the perfect way. We spent our Valentine’s Day spreading the love the best way we know how: By holding a clinic that offered free spay and neuter, vaccinations, microchips and so much more to over 200 cats and dogs. This February 14th clinic, held at Gilbert Lindsay park, was our busiest clinic yet. After teams of DDR volunteers went door to door to pass out flyers over two consecutive Saturdays, the message got out to families with pets who live in 90011, and the message began to spread. We decided to focus our efforts on 90011 because the average income there is less than $30,000 per year, more than 60% of the residents rent their home, and it’s a very dense area with a population of more than 100,000 people. There are a lot of dogs and zero animal hospitals located in the immediate vicinity. Many homeless people live in the park, and many people have no transportation other than the bus, which does not allow dogs or cats on board. Getting help for pets is scarce. There were so many highlights at this clinic, so many wins. Seeing all the families who brought back their puppies for their next round of vaccinations. The exams we offered right on the spot where doctors explained how to care for various types of chronic medical issues also brought us much joy, as it provided each pet a more compassionate and humane existence. Plus our spay and neuter sign up sheet got so full, it looks like we’ll be booking our next free clinic on Sunday, March 13th! Parvo, DHPP and rabies vaccinations were given to all dogs over four months old, and puppies weeks and older received their boosters and worming medicine. Every pet received free flea and tick treatment thanks to a donation from the manufacturer of Frontline. In that vein, we also appreciate everyone who donated hundreds of pounds of dog food as almost every family went home with a big bag of kibble or a case of canned food. There were collars and leashes for those who needed, and we were there for the cats as well. The park staff was incredibly supportive, allowing us to hang up two banners in the park near the basketball courts and soccer field. Flyers hanging in the recreation room also helped get the word out. It was incredible to watch a line forming so long, we had to cut it off an hour before the clinic was scheduled to shut down just to manage volume. Our SCVMA volunteer vets and vet techs were amazing and generous with their time, as always. The fact is that without their support these free clinics would not be possible. Adding to the stellar team, Amanda, our Shelter Intervention Program counselor, set up her table right at the park, positioning herself to give further assistance to families with pets needing a further hand. We were able to help several serious medical issues, including a very large hernia on a very small Chihuahua. January numbers are in — We’re starting 2016 off right! 64% of our clients needed help with medical expenses. The problems ranged from skin treatments to ear infections, from paying for X-rays to getting blood tests to removing tumors. Many animals required treatment for upper respiratory infections, Parvo, broken bones and so much more. More often that not, the cases were emergencies, with the pet being in extreme pain. 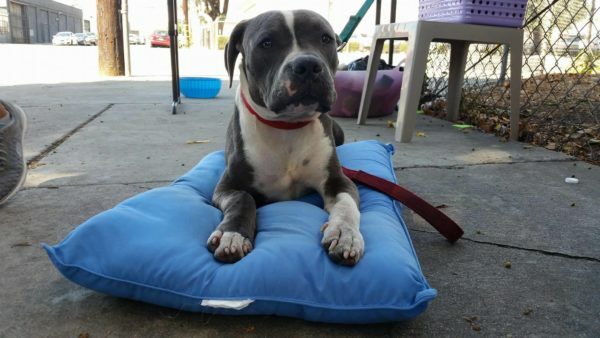 In situations like this, the owner usually doesn’t know where else to turn but the shelter. We assisted 15% with spaying/neutering their dogs or cast. 9% of the families needed help getting their cat or dog out of the shelter. 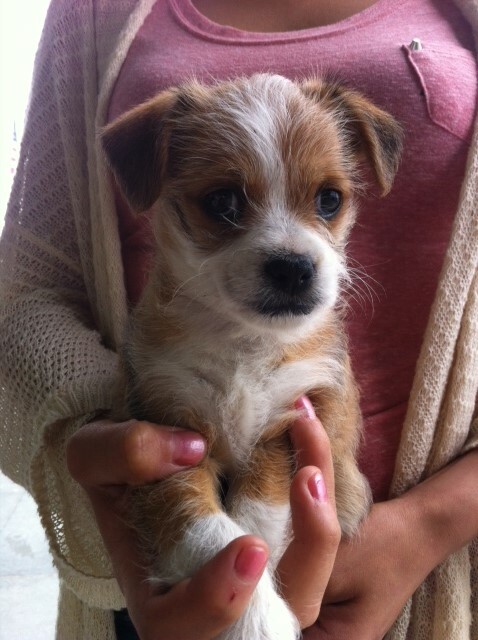 It costs money to redeem a lost pet, and in order to send them back home together, we helped pay the fees. The most common reason for being impounded in the first place was that their dog accidentally got out of a gate. 7% of people had a senior or terminally ill pet. 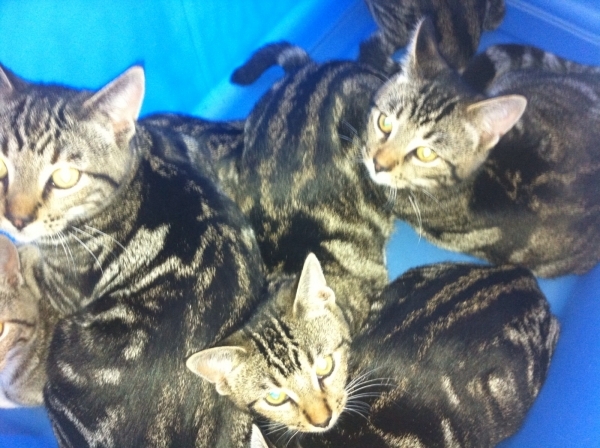 We sent them to our local vet for care or humane euthanasia, instead of watching them get surrendered to the shelter. We are grateful for the opportunity to help old animals pass in a calm environment, surrounded by the people who knew and loved them. We were able to help about 2% of those we served with pet deposits, making it possible for them to keep their dog or cat. Another 2% had no alternative other than rehoming their pet. We supported them through it. Lastly, 1% needed dog training to solve their issues. We offer training classes every Saturday morning, free of charge, not only to people who are facing extreme challenges with their dogs, but to the entire South LA area. 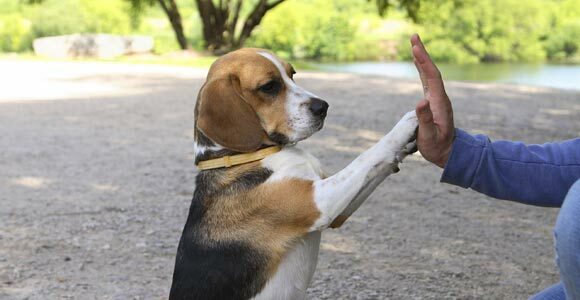 Our dog training classes have been going on for years, offering community as well as bonding between pets and owners. So that’s 91 animals who avoided shelter life, avoided clogging up the system further, and were able to stay in their first homes, their forever homes. We want to thank our major funder Found Animals Foundation, because without their support this program would not function, and we would not be able to do what we’re doing. We also want to thank LA Animal Services staff and volunteers who are terrific partners to work with and who allow us to be in the shelter, helping families with pets. And of course, we’d be remiss if we didn’t thank all of YOU again and again. You, who donate to support us and believe in our efforts. Without you, we wouldn’t be able to offer so many options and such a range of resources. You give us the confidence, and the energy. You make us stronger. Because everybody needs help sometimes. We know it. You know it. Thank you for trusting us to be that help. National Change A Pet’s Life Day + #GiveFive kick-off! 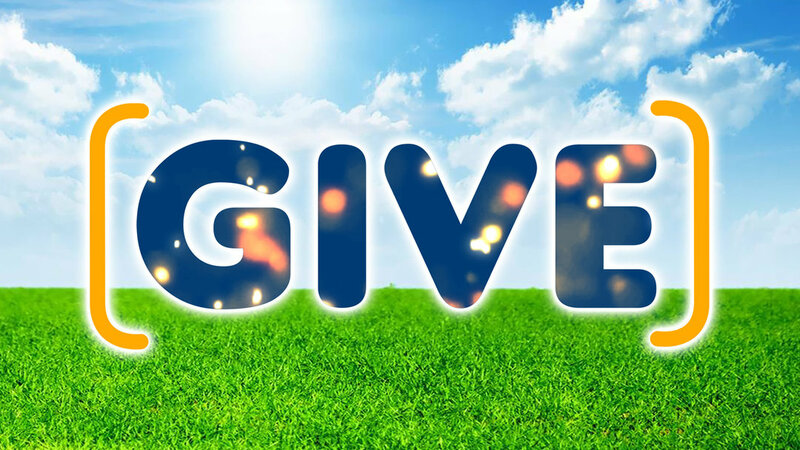 #GiveFive is a social initiative to raise awareness for Downtown Dog Rescue and encourage donations towards our rescue efforts — even just $5! Please, please, please join us today for the kick-off. Share to your social media sites with the #GiveFive hashtag and @DowntownDogRescue and tag up to 5 friends challenging them to do the same. Donate $5 (or more!). Ready to give? 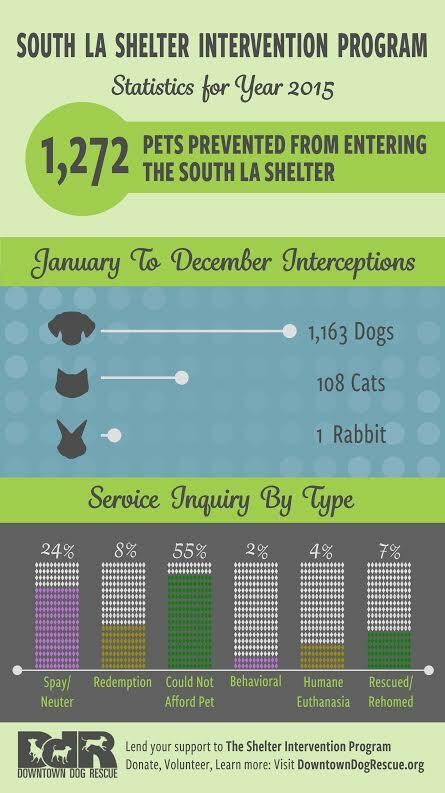 What could be shorter and sweeter than summing up the success of our Shelter Intervention Program (SIP) for 2015 with a cool graphic? 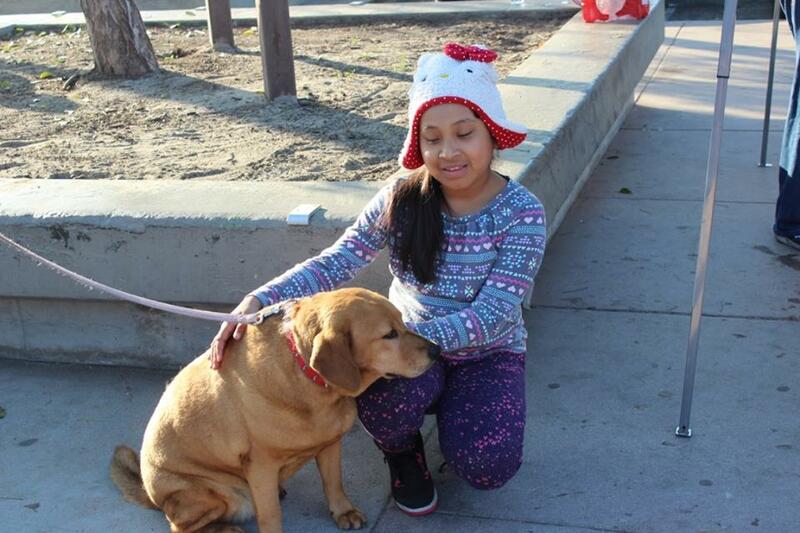 Last year 79% of the cases that came to our South LA Shelter intervention office needed financial assistance to pay for medical care, spay /neuter, a pet deposit, a dog run installed at their home, or fence repair done in their yard. All of our families were unable to afford these needs on their own. With so many free spay/neuter resources out there now, that issue was the easiest problem to fix. But it was more challenging to figure out how to pay for a puppy dying of parvo, or a cat who would not eat, or a dog who was hit by a car or attacked by another dog. Furthermore, there were severe dentistry cases, wound care, tumor removal, ear and eye infections, blood work and so much more that required us to dig deep into our organization’s funds. We were able to do it because of our major supporter, Found Animals Foundation. Without their grant, the SIP program would not exist and we could not have said yes to all of these people and all of these animals. We also want to thank LA Animal Services for being a great partner and for allowing us to be in the shelter, helping the families who need us. 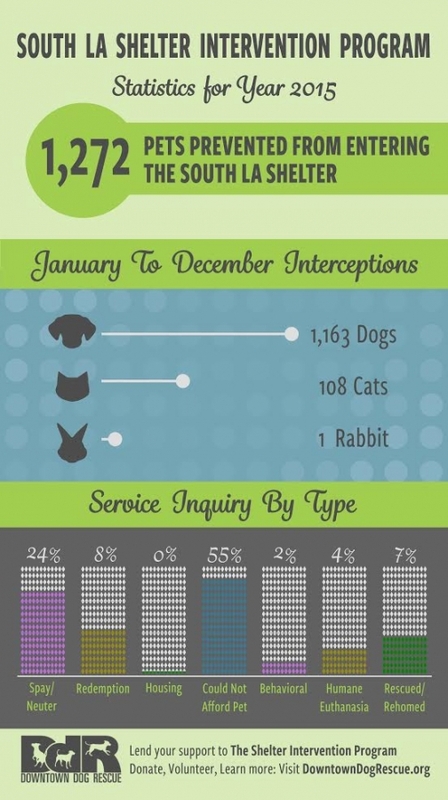 We were able to prevent 1272 pets from entering the South LA Shelter in 2015. That impacts not only those animals, but all the others who get to stay at the shelter longer, at less risk of running out of space and time, until their adopters are found. Lastly, we must thank all of YOU who support this program and make it possible for us to keep pets in their first home, forever home. Because you know that we all need help sometimes, that the very fingers pointing blame can be used to extend a hand. Thank you for being our hand. And now we’ll let these statistics speak for themselves. Feel free to share them!